The journey of a Division III student-athlete is seldom considered. Through the daily routine of practice and intensity of competition, the stepping stones of what brought the athlete to where they are now can easily be forgotten. 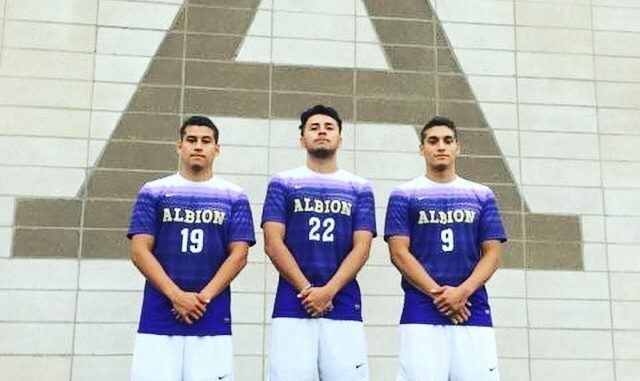 For three members of the men’s soccer team, the journey to Albion College is not as much a reminder as it is a family affair — a family affair that stemmed from opportunity, support and above all, dreams. Gabe Martinez is a junior from South Lyon, Michigan. In his third year on the Briton soccer team, he has established himself as an integral player, dishing out two goals and three assists in the 2016 season. His younger brother, Michael, is a first-year student and is also part of the team. A promising player out of high school, Michael ran into a bit of misfortune this season and is currently recovering from a broken leg. Last, but certainly not least, is Christian Hurtado, their cousin. Hurtado spent two years at Phoenix College in his home state of Arizona before making the trek to Michigan to continue his academic and athletic career. For Gabe, Michael and Christian, the journey began miles away, in the Mexican city of Guaymas, Sonora. When Gabe and Michael’s father was offered a job in Arizona, the entire family moved to the United States, with Michael still in the womb. Although their trek has now led them to Michigan, the three always consider Guaymas to be home. This blend of culture also translated athletically, as the three were able to see many different types of soccer through their family roots. In Mexican states like Sonora and Sinaloa, the state from which Gabe and Michael’s mother is from, street soccer proved to be a test of both skills and smarts. While soccer remains a constant in their present lives, they also are cognizant of the future. A political science major, Gabe is planning on attending law school after his time at Albion. Christian is studying international business with plans to go into the restaurant industry. Given that he is only a first-year, Michael is undecided on his path of study, but he is interested in both journalism and international business. Wherever their lives may take them, all three Britons are committed to one thing: being proud of what has brought them here today.